Last weekend I attended my 10th college reunion. In addition to seeing people I haven’t seen since our 5 year, enjoying the annual alumnae parade (headed by a woman from the class of 1934! ), and generally indulging in nostalgia, I had a chance to reconnect with two aspects of my undergraduate experience which helped shape my scholarly life: the History Department and the Vassar College Costume Collection (VCCC). 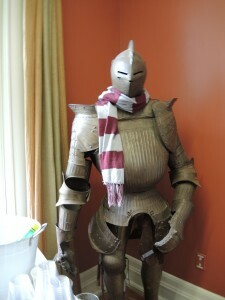 Suit of armor in the faculty lounge, displaying school spirit while guarding the drinks. The History Department at Vassar is particularly collegial, or so it has always seemed to me, both as a student and an alumna. At the end of the school year the Department would host a “tea” (more of a potluck), and there is always a reception during Reunion. This year was particularly exciting because Swift Hall, the Department’s home, was recently renovated. All history faculty are now under one roof, the interior corridors feel much brighter, and what was the cramped-feeling office is now an airy lounge space for the faculty to gather. Although the number of class rooms dropped from three to two, those two classrooms have projectors mounted from the ceilings and I think they were even smart boards. If nothing else, the rooms actually feel big enough now. I loved the classes I had in Swift, but a class of twenty to thirty students felt crammed in, elbow to elbow around the table with people in chairs along the wall. I was told that intro level classes and senior seminars get priority for the Swift classrooms, a good strategy. It allows new students to get a sense of the Department as a whole, especially with all the faculty there, and brings the seniors together. Mid-level classes, generally taken by majors, are elsewhere on the (not very big) campus, which is fine because these students are already engaged with history. Of course, the reception wasn’t just about seeing the new building. I got a chance to chat with a number of the faculty members. I may not have achieved my personal goal of advancing to candidacy before Reunion (hopefully by Christmas! ), but everyone was happy to hear about my choice to work towards a PhD, as well as my digital work. I had a lovely chat with James Merrell, who apparently has Lucy Maynard Salmon‘s desk in his office! * As when I was a student, every faculty member engaged with the alums with joy, friendliness, and a lively interest. I am so grateful that both my undergraduate and graduate departments have had such wonderful, kind faculty (and staff!). After reconnecting with the Department on Saturday, I had a chance on Sunday to visit the collection that provided my material culture experiences during college: the Vassar College Costume Collection (VCCC). The Collection is part of the Drama Department, originating in historic clothing donated to be costumes for shows at some point in the 20th century. When I was a student, maintaining the collection was one of the duties of those of us whose work-study was in the Costume Shop. It was my first experience with the conservation side of historic textiles and opened my eyes to the challenges as well as the joys of dealing with collections items. There’s one item in the collection which was made with ostrich feathers that sheds obnoxiously whenever it’s moved (the link goes to an Omeka installation, created since my time). For Reunion, the VCCC put on an exhibit of selected garments accompanied by fashion plates. 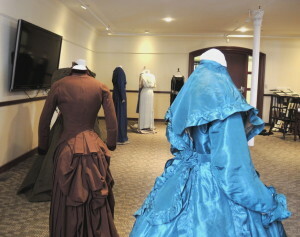 I visited the exhibit a few times, but on Sunday I had a chance to talk with Arden Kirkland about the exhibit, historic fashion, history, digital display, and a host of other subjects. Arden has a great project in the pipeline which will be a great resource for fashion historians and a good example of the benefits of digital to fashion (and other forms of) history. Although right now I’m working with textual sources, I try to be mindful of non-textual sources, both for the dissertation project and more generally. My conversation with Arden also wandered into pedagogy, the diverse audiences for fashion history (fashion historians, historical costumers, cosplayers, etc), digital tools, and the importance of metadata. As a historian/PhD student, my visit back to my alma mater reminded me of the groundwork my time there laid for my current path as well as how much I’ve grown as a scholar in the last ten years. Now to see if I can make it back (in a professional capacity) before the next reunion. *I touched the desk! LMS is one of my heroes – I started her Wikipedia entry.